The first documented evidence of a church in Faversham goes back to 1070, in a Charter of William the Conqueror, giving the church to the Abbey of St Augustine at Canterbury – just four years after William’s invasion. However, Faversham’s parish boundaries were established circa 636, which strongly suggest a parish church prior to William’s Charter. By the 9th Century, Faversham had become an important town and would certainly have been a place of Christian worship. The size of the church is an indication of the town's importance in the Middle Ages. 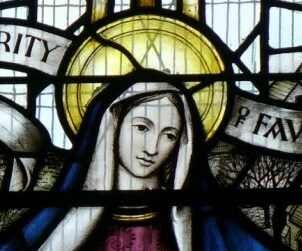 The church is one of the few dedicated to St Mary of Charity, one of the town's surviving links with Faversham Abbey, whose mother church in France was similarly dedicated. The Abbey had King Stephen as a benefactor, and Stephen, his wife Matilda and their son Eustace, were buried in the Abbey. Legend has it that when the Abbey was sacked and dissolved, the remains of Stephen, Matilda and Eustace were dug up and thrown into the Creek. Stephen's bones were rescued and placed in an empty tomb in the Trinity Chapel of the parish church. Although the tomb is marked by a Victorian brass plaque, we cannot prove that these are Stephen's remains. Equally, we have no way of proving that they are not, since the tomb has no other inscription! Inside, the church is a treasure trove of history. The interior of the church was remodelled in the latest style from 1755, however only the nave survives in the Georgian style. The original box pews (replaced by the Victorians) came to the height of the square parts of the existing pillars, so no-one would have been able to see members of the congregation dozing to sermons! One of the greatest treasures in the church is the painted column featuring ten events in the life of our Lord. Dating from circa 1306, the column is one of only a few to survive in Britain. 12 of the 16 medieval stalls with finely carved misericords are the work of a gifted 15th century woodcarver (four are facsimiles made by a talented Victorian carpenter). They were believed to have been removed from the Abbey before it was destroyed. Each is carved from a single piece of oak and they are therefore very heavy. Please do take care when viewing the carvings, as the hinges are very old. The hinges are gradually being restored, so visitors may find a temporary timber seat in place of a carved one. Not be missed are the brightly emblazoned tomb of Edward Fagg and the unusual aisled transepts. Edward Fagg lived in Faversham during the reign of Elizabeth I and, in true Faversham tradition, had a stand-off with Elizabeth's officials when they tried to commandeer his wagons! "Though Faversham parish church was only half the size of the original Faversham Abbey church, it was (and still is) very large by most parish church standards. In fact it remains larger than some of the UK's smaller cathedrals. Maidstone parish church has always claimed to be the largest parish church in Kent, but in fact Faversham is larger, by a whisker. "The parish church's transepts were, and are, longer than those at Rochester, and wider than those even at Canterbury, Rochester and Faversham Abbey. I don't think the church's large size was any accident; I think it was making a statement about the stature of Faversham - important if you were quarrelling with the Abbey, as the Council so often was."